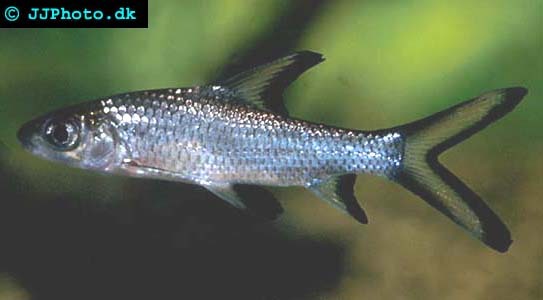 Company: Balantiocheilus melanoptrus (Bala shark) can be kept with other non aggressive species. Aquarium setup: Balantiocheilus melanoptrus (Bala shark) grows very large and adult specimens should not be kept unless you have a very large aquarium. Balantiocheilus melanoptrus (Bala shark) spend a lot of its time searching for food in the bottom substrate and a fine grained sandy bottom substrate is therefore to be preferred. Sharp aquarium décor should be avoided since this species have a tendency to hurt itself. The aquarium should be decorated with a lot of free areas to swim on and dense planted areas along the sides. Balantiocheilus melanoptrus (Bala shark) requires high levels of oxygen in the water and an air pump is beneficial. They are schooling fish and should only be kept in groups. 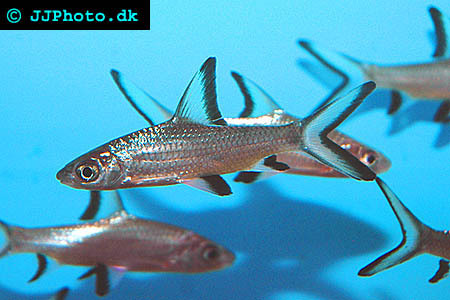 Breeding: Balantiocheilus melanoptrus (Bala shark) has not been bred in captivity without the aid of hormone injections.